This bracelet is sooo scrummy, I really love it. I think that I will make more like it in different colour ways... what do you think? Ooooh, lots of piccies, I know, but, I am SO pleased with it, and when the bride says she is so, so delighted with it, well, I just can't help showing it off... too much trumpet blowing??? Ok, I'll keep quiet now, but just a couple more pics????... please? The matching set... Necklace, cuff bracelet and earrings. 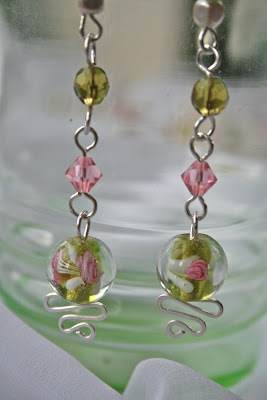 Squiggle earrings.... the colours all match the theme for the wedding.. 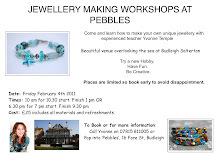 The other great news is that I have been asked to consider running some workshops in a bead shop on the East Devon coast... well, is there really anything to consider??? Yay, Yay yay... dance around the lounge, big grin... me? They want me.. wow, I am sooooo excited. ... can you tell?? I'll keep you posted on the outcome. Ooops, sorry, this last one just snuck in when I wasn't looking!!!! Oh they are beautiful, so talented! You are destined for great things . . . . . . . Thank you for visiting my blog and your lovely comment. Your jewellery is very beautiful - and you obviously live in a very beautiful part of the world, too. Thank you for visiting my blog and your lovely comments. Wow what beautiful jewellery. That is totally amazing. The colours are so pretty together. Have a wonderful weekend, and thank you for replying to my comment. Hi Yvonne, thanks for dropping in on my blog. It reminded me to come back here to have a look see what your up to now. 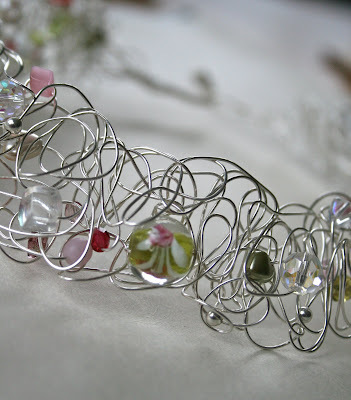 I can say that, that wedding jewellry is stunning. You must be good if they have invited you to do some workshops. Good for you. Now about these two headed lettuce and the plastic peppers. Yes sure there is a story in there somewhere.